Whenever you buy a sufficiently expensive product – usually anything over $100 or so – you’ll find a registration form in the box. 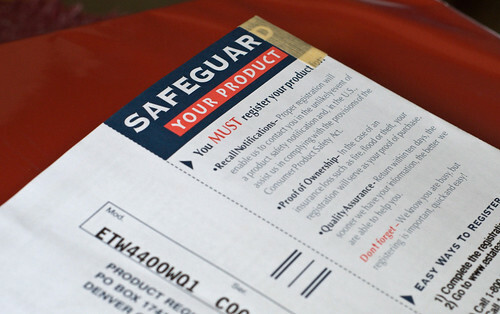 For many products, you need to send in the card to validate your warranty. For some products, you need to send in the card to get additional features. However, registration cards are one of those “not urgent” tasks that tend to get lost in the shuffle. Nothing’s demanding that you take care of it immediately, so it’s easy to put it aside and forget about it. Don’t. You’ll be very glad you did when you’re able to turn in a faulty product under warranty or receive a key item in the mail. Registration forms are a double-edged sword. On the good side is that registration is often the necessary piece to validate your warranty on the product (check your product documentation to make sure). Also, some companies that are customer-service focused will sometimes send you key things. One company (I think it was Black and Decker, but I’m not 100% sure) once sent me a replacement part and explanations on how to fix it out of the blue, for example. Other companies will send you additional material related to your product, like a pack of drill bits for a high-end drill. On the bad side is the fact that marketers will use the information you send in to sign you up for marketing materials. This can be rather annoying, as it often comes in the form of junk mail. Of course, with a bit of effort, you can completely mitigate the bad side while leaving the benefits unaffected, making the registration card well worth filling out. The first step is to create an email address that’s specifically for promotions. I have a separate email account that I use solely for including with product registrations, signing up for customer rewards programs, and other such things that marketers often use. Whenever I’m about to make a purchase, I search the email in this account to see if there are any coupons or offers I should know about. If I use this address for the registration, then I know I won’t be receiving this “junk” mail in my normal email account. I don’t have to deal with it at all unless I choose to. Another useful tactic is to not answer any questions on the form other than what is minimally needed to register your product. Many registration forms ask a lot of questions about other products you’re interested in and so forth. Don’t answer them at all. Instead, just focus on what you need to fill in to register the product – your name, your address, and the receipt is usually all that’s needed. These extra questions usually only exist to provide more material to marketers. The questions help marketers figure out what mailings will work best to get your attention and convince you to buy stuff you don’t need. Not filling out the questions makes it much harder for them to hook you. Take these steps, fill out the form, and get it in the mail as soon as you can. You’ll be glad you did.